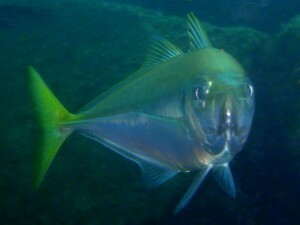 Japanese jack mackerel (Trachurus japonicus). An estimated 2.8 to 16 billion individuals of this species are caught each year. It has been estimated (in 2019) that between 0.79 and 2.3 trillion* fish (ie 790,000,000,000 to 2,300,000,000,000) were caught from the wild globally each year for 2007-2016. This is an update to an earlier estimate (in 2010) of between 0.97 and 2.7 trillion* fishes caught from the wild globally each year for 1999-2007. Details of the earlier 2010 estimate are available here. The fall in wild-caught fish numbers between the two estimates is very largely due to a decline in Peruvian anchovy catch between 1999-2016 and, to a lesser extent, a decline in capelin, Japanese anchovy, sandeels, European anchovy and Black and Caspian Sea sprat. See below for a more detailed analysis.